While we were in Mexico city we were lucky enough to spend some time with Fabi, a great gal who just happens to work in PR for one of Mexico’s up and coming designers (yes, I know how amazing is that!). One of the first things I noticed was Fabi’s really awesome ring…I was in love with it the moment I saw it and, lucky for me, it happened to be designed by Paola Hernadez, the designer she works for. 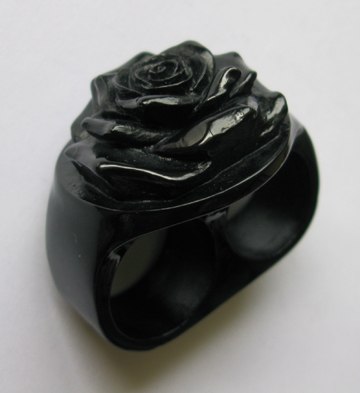 Fabi invited us to the showroom which was pretty cool and it was there, in the actual showroom, that I bought the amazing black rose ring. The ring comes in a few other colours but since black goes with everything I figured that was the best choice. It is pretty comfy to wear, though having a ring sit on two fingers does take a little getting used to, and it is very cool to have such and unusual ring by a Mexican designer! I love your blog….the writing! I feel like I’m tucked away in the back of your VW. And the banner design…need I say more! Thanks for dropping by…how are things in Vancouver? We are having a ball and getting to record it is definitely a treat for us.